On American University Week: Where does the fight against ISIS stand today? Tricia Bacon, assistant professor at the School of Public Affairs at American University, examines how terrorist groups with allies can come back from the dead. 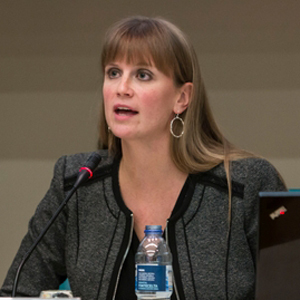 Tricia Bacon, PhD, is an Assistant Professor at American University’s School of Public Affairs. She is the author of Why Terrorist Organizations Form International Alliances to be published with University of Pennsylvania Press in May 2018. Dr. Bacon is a non-resident fellow with George Washington University’s Program on Extremism. She is also a senior fellow at Fordham University’s Center on National Security. She was previously a Pre-Doctoral Fellow at the Brookings Institution, a Visiting Scholar and Terrorism Research Award recipient at the National Consortium for the Study of Terrorism and Responses to Terrorism (START) at the University of Maryland, and a PRISP Fellow and Presidential Management Fellow at the State Department. She earned her PhD in International Relations at Georgetown University. Her research focuses on terrorist and insurgent groups’ behavior and decision-making, U.S. counterterrorism policy, and the role of intelligence in national security decision-making. She has published articles on terrorist group alliances, terrorist leadership, terrorist safe havens, and other related topics. The Islamic State’s territorial losses in Syria and Iraq led to declarations by analysts and policymakers alike that the group has been “militarily defeated.” However, the Islamic State is well positioned to survive these setbacks for one major reason: it has allies. Terrorist groups with allies enjoy numerous advantages. They conduct attacks that result in more deaths and are more apt to seek weapons of mass destruction. They survive longer. And, importantly in the case of the Islamic State, they are more capable of recovering from losses. In my research I examine the causes of these dangerous relationships. While terrorist groups usually benefit from alliances, they form alliances because of deficiencies which they can attempt to address on their own or they can seek a partner to help them. If they choose to find an ally to assist, they look for a partner that can address their weaknesses and that shares their ideology. At the Islamic State’s peak, it offered allies substantial resources as well as the reputational benefits that came with adopting its name. A number of its allies were previously unknown entities seeking greater prestige in jihadist circles or once-powerful groups struggling to attract new members. For its part, the Islamic State’s claim of leadership of the jihadist movement relied on declarations of loyalty that came through alliances with other groups. Now that the the Islamic State is weakened, its allies are returning the favor. They allow the Islamic State continue to project threat and viability in places ranging from Southeast Asia to the Middle East to West Africa. Its alliances make genuinely defeating the group a much more difficult task and increase the likelihood that the Islamic State will re-emerge once again.